Did we "make" it yet? If the ad/picture to your left will allow it, the picture should display the name Zundel Berman Books. Although not owned by old man Zundel anymore I'm sure his nephew, the current owner, paid a pretty penny to keep the old name intact. I'd go as far as saying that most people may not know that Z no longer works there, which leads me to the point of the story here. There was a time way back when the name "Zundel Berman" was synonymous with Snag. Before you say "there he goes again with the Snag talk" hear me out. Some Lubavitchers dub every non-Chossid - from the MO guy to Reb Chaim Kanievski - a "Snag." I'm not that uncouth; I realize the differences, me being extremely observant and noticing the nuances when it comes to things like that. Which makes me wonder: when did the term "snag" come into use in Dor Hashvi'i Chabad? Did it come together with the Chabad Talis and Surdut/Sirtuk? Maybe Schneur can answer that. Why do I single out Z? Although I usually refrain from the heavy Loshon HoRah Z is special and deserves some of the negative attention he'll get here. He's special because the dislike for Chabad that this man has running through his veins is unlike anything I've ever seen. You'd think a man with a good business would be past that and wouldn't run around on his bike tearing down Chabad signs in Boro Park like some young hothead in Williamsburg does. You'd also think that a grown man in his 60's with grandchildren wouldn't walk half a mile to daven in a shul that he's never davened in just because he heard that some Lubavitchers moved in there and plan to "take over the shul." And I don't mean just daven there, he went there to stir up trouble and "save" the shul by any means necessary, even if it meant time and money spent for the cause, just so that the darn Lubavitchers shouldn't get their hands on it. A guy like that seems to have it in for Lubavitch. Maybe he had a Lubavitcher melamed back in Yerushalayim as a kid that rubbed him the wrong way. Who am I to judge? The Lubavitchers have gone on to bigger and better things, but the memory of Zundel and his antics at the old shul in Boro Park live on in infamy for those who witnessed it. Some of us in Chabad are always wondering whether or not we're accepted among the true Jews of Lakewood and Bnei Beraq. It bothers us and we try hard to change that perception that we're different and not authentic. We look for every little sign that maybe the tide has turned and things have begun to change. 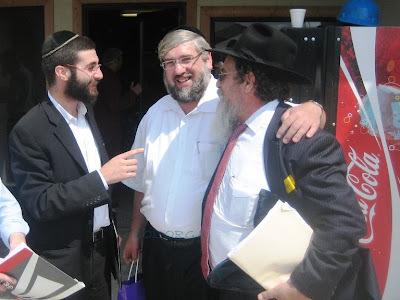 Be it a no-name Rav or Rosh Yeshiva who makes an appearance at a Chabad event, or a Chabad yeshiva class that gets farherred at the home of a prominent Rav, those of us who care get very excited over events like those. So if a prominent seforim seller like Zundel, to whom Chabad is like a red kerchief for a raging bull, although no longer under his ownership, chosses to advertise on a Chabad site like COL just so that Lubavitchers and their centers should shop there, this is cause of muted celebration. IN NO WAY IS THIS AN INTENTION TO C"V HURT THE BERMAN BUSINESS. I, MYSELF, WAS A FREQUENT CUSTOMER WHEN I LIVED IN BROOKLYN AT BOTH THE BP AND CONEY ISLAND AVE STORE. THEY HAVE A GREAT SELECTION AT UNBEATABLE PRICES. HANDS DOWN. His first claim to fame is that he fought Chabad. In Bnei Beraq that seems to be enough to qualify you as a Godol. I wonder if they write that on Matzeivos too. Like "Shliach of the Rebbe." YNet examines Leil Shabbos in a pub in Israel. There are those that say that the fact that Charedism/Chassidus has seen such a boom in the post WW2 world means little. It's all about the culture, they say, there's very little G-d in anything most people do, it's just that people are sooo afraid of what others will say that they stay in their own little worlds, often miserable and unsatisfied. The proof - they say - is in the fact that you see people doing very little in the realm of Torah and Mitzvos, yet they hold on to trivial things like certain aspects of dress for dear life, often to the extent of near Mesiras Nefesh. I'm not even speaking of elements of dress that could be confused as Inyonei Kedusha, just things picked up in our travels across Europe over the centuries. The above article seems to give credence to that cynical argument; namely that in today's world it's mostly cultural, and we shouldn't get so excited about the boom of yiddishkeit in Israel and the Diaspora. If Schneur has taught us one thing here over the years it's the fact that decades of accomplishment can be scoffed at in an instant, and statistics - real stats - can be discredited in the bat of an eyelash. The article speaks of a group of boys and girls from chassidishe yeshivos and schools get together on Leil Shabbos in somebody's apartment and discuss the events of the week. These are Chozrim B'Sheylah, the antithesis to Chozrim B'Tshuvah if you will. They make Kiddush, eat gefilte fish, sing zemiros and have a grand ol' Jewish time, each doing his thing just like they did it where he grew up. The Belzer makes kiddush like they do in Belz. 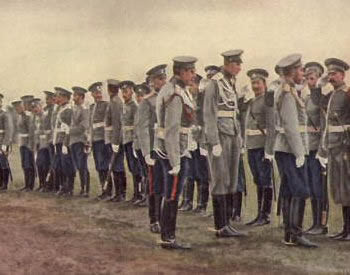 The Vizhnitzer sings zemiros with a vareme Vizhnitzer niggun, and so on. They talk about who got married and who got engaged, and whatever else is going on back in Bnei Beraq. When they're done they head out to a local pub to do what people do in pubs and bars. They seem to have it all; they have the trappings of a shabbos complete with Koh Ribon and Koh Echsof, and they have a Friday night like the rest of the world knows how to have, complete with all-nighters. Kind of like Chulent here, but in a more "in-your-face" kind of way. Friday night. So here we have the first signs of a new generation. A generation where the culture is firm, yet that's all there is. And they hold on to what they've been taught with commendable devotion, nusach and all. Of course we can't learn a lesson from the behavior of those on the fringe, can we? The foundation is strong, we tell ourselves, just look at the number of Shtreimlach and Kapotes and Black Hats, and how they're growing by leaps and bounds! But any real introspection will tell you that the trappings are there but not much else. When was the last time you saw an average, simple man crying on Yom Kippur or any other davenen for that matter? When was the last time that were it not for a major tragedy that you saw people express any emotion during a Tefilloh or a Mitzvah? Yes, people are more acceptive of others, and they don't have the silly, deep-seeded disdain for foreigners and anybody not from their circles they used to have in the old days, but what did we gain in the trade? If there's anything that bothers people like me it's the fact that we think that we're the only ones left that have stayed somewhat true. We look around and it seems that the rest of the frum world has morphed into one identical bloc with the only difference a different hat or the color of socks. So, after a while, you begin to wonder: אפשר בין איך משוגע און זיי נארמאל? Maybe everything I've been taught is Takeh wrong and everybody else is right? Didn't Reb Chaim Brisker once say that אף א גלייכע וועג טרעפט מען מענטשען? So if I'd be on the Glayche Veg I'd probably find other people too, no? You see my friends, Chassidus isn't brainwashing after all, it allows one to rethink his priorities at any given time and to leave if he so pleases. Most people just choose not to. Anyway. Every once in a while you hear pisgomim and vertlach from chassidim of other Rebbes and you say to yourself "I'm not so bad after all, just look at what these guys believe and in whom they believe!" Case in point: There's a chassidisher vort (not Chabad) that's Nogeia LeMa'yseh that goes something like this: "Besser Unzer Binyan Vi Zeyer Minyan", which loosely translated means, if you have the choice of davening in either your own shtiebel BeYechidus, or in another Chassidishe shtiebel with a minyan, daven alone in your own shtiebel. I guess the idea is that if you start wandering elsewhere, even if just for a minyan here or there, there's no telling where you'll end up. You might find that the other group is better than yours, has more Lomdim and Yerei Shomayim than yours, or (gasp!) their Rebbe is greater than yours, and that we can't afford. So they tell you that somehow the fact that you daven in your Rebbe's shtiebel makes up for the lack of a minyan, even if the Rebbe is like 6,000 miles away. Oh kayy. Sounds weird, no? Now, truthfully there are Lubavitchers who find it difficult davening elsewhere, as do I, but I push myself, even if it's not easy to do, either because I have a guilty conscience and realize that G-d wants me to hear Kaddish and Kedushah, or because of my kids. Believing in Hashgochoh Protis is a good thing. Were it not for that I might never have listened to the Berel Wein tape I found in the car my neighbor was nice enough to loan me while mine was in the shop. Much of the conversations on the tape centers on the Jewish of Eastern Europe during the last 3 centuries and what they had to endure, including pogroms, induction into the Czar's army and so on. This may not come as a surprise to many of you, but RBW seems to be straddling the fence when he speaks about life in the shtetl, this despite him being a Rav and frum Jew. He almost seems to apologize for the millions who left the fold at the outset of Communism, Socialism and Haskalah, as if they had all the reason in the world to do so after being sold out by the frum establishment all those years. You may have a wayward youth speak that way, or an amateur student of history that has trouble with some his recent findings, but a Rav?! Once thing's for sure, the man is open and honest about almost everything he talks about, even if it makes him and his co-Religionists look bad. You might even say that he takes his information directly from secular and anti-Religious books and texts. When he speaks about the Cantonisten he goes as far as blaming the Rabbonim, Shochtim and Roshei HaKohol for sending off the kids of the poor when they were required to furnish the army with an amount of kids from their town. Never would you hear that when growing up and hearing that from your sixth grade Rebbe, they made it sound as if kids were grabbed by soldiers who would burst in to people's homes and grab kids from their mother's arms. Which makes you wonder, if Rabbi Wein is part of the Rabbinic establishment - at least the MO eastablishment - why would he condemn the leaders of yesteryear like that? They all get it, do you? We can all learn a thing or two from the editor of the Yated. He seems to know when to drop the "ideology," especially when the livelihoods of so many people are at stake, and when people seem to have lost their minds. Kudos to PL for taking such a firm stand and for speaking out when others were afraid to. Maybe there's hope for the rest us too. Seriously. I need to know for a friend who these 2 gentleman are. The first one looks familiar, I know I've seen it before. The second one I've never seen. I recently came across the site and was quickly impressed. It's clear, concise and uncluttered. You see everything right in front of you, without those lousy flashing ads distracting you eyes. 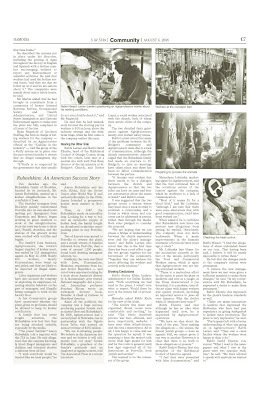 Yes, it focuses on Chabad and Chabad happenings, but it also branches out into the general and Jewish world. The layout seems to be modeled after the Drudge Report, and the name is a catchy one too. He links to blogs and other websites with a twist of his own in the link telling you his opinion of the story, which gives the reader an idea of what he/she's gonna read. I wish him lots of luck. The folks in MatzavLand are excited! In Israel there's great excitement, especially at the Yeshivah on the Hill in Bnei Beraq. A great scholar is coming from thousands of miles away, and will share his thoughts on the Talmud and its commentaries with the students there. Not that there's been a lack of Torah scholars there; they've had the greatest minds of the last three generations there, toiling in Torah, often forgetting about the physical aspects of life for years, and only focusing on their studies. Giants among men, they've been keeping the flame of the Torah alive there even in times of crisis and war. One might even say that were it not for that lone outpost Torah in its purest form may have been totally forgotten among the People of Israel. Names that are today legend all walked those hallowed halls and disseminated the wellsprings from within that vestige of hope. Harav Yosef Shlome Kahaneman, Harav Shmuel Rozowski, Harav Dovid Powarski and his son Reb Berel, Harav Shlome Berman and others, were it not foe the Harvard of yeshivos we might have never heard of them. Why then is there a special buzz there these days? Who could create that excitement if all the great ones were there and most novella was already expounded upon there? It's a Chassidishe Rebbe! Yes, my friends the Bobover Rebbe, the "Rebbe the Talmid Chochom" as Rav Chaim Kanievski calls him, is coming to the Yeshivah to give a shiur kloli at the annual Yarchei Kallah tomorrow. In Israel, where everything is historic, they're very excited about it, and a very large crowd is expected to be on hand to see what this man can do. Not since the days of the Vaboylniker Tzaddik, when the great gold Aron Kodesh would somehow give credence to his bombastic, divisive words, has there been this kind of buzz. Truthfully the pressure must be tremendous on Reb Mordche Duvid, being that he somehow represents the entire Chassidishe world since the Baal Shem Tov himself. Somehow he'll vindicate them all and abolish the stereotypes if he aces the test that the once-mighty Ponovezh will put up for him. We spoke about this last year, When the Satmar Rebbe was called to Lakewood's BMG to give the keynote address at the 25th anniversary of Rav Schneur's yohrtzeit. We thought that it was weird that the best they could do at such an auspicious event was to bring in a Rebbe, albeit a Talmid Chochom, to speak, when they could bring one of hundreds of his Talmidim. We've also discuused how Chassidim in general have this inferiority complex when it comes to learning, and that they always need to prove to the Yeshivishe Velt that they too stress Limud HaTorah and not just food and drink. So they bring in Litvishe Roshei Yeshiva into their yeshivos - often making them change their Levush to conform - and try and make Talmidei Chachomim out of their boys. In some cases it works out, and in some cases - like Reb Gedalia Nadel and Vizhnitz - it doesn't. The Litvak opens their eyes a bit too much and gets them to rethink their belief system a wee much. But now it seems like the tide has turned just a bit. For the second time in a little over a year a Rebbe has been invited to present a shiur at a very important event, when the eyes of the whole yeshiva are upon it. Many former Talmidim, many of them zeides, come back for a few days of learning. 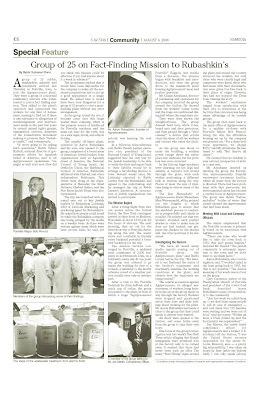 In the Yeshivishe media the Yarchei Kallah is seen as time of policymaking - similar to Shteyedige Torah in Belz - and is widely reported about. What does the fact that they took a Rebbe to deliver the keynote address say about Ponovezh, have they too lost their way? Or is it all about money? did Freshwater pay the Yeshiva for this zechus and they couldn't refuse? Time will tell. But either way, whether it was for lack of anyone better, or for a promise of a couple of bucks, the shiur to be given tomorrow tells us a lot about the situation. Maybe they're tired of the same old shiurim and want to see what a Chassidisher can bring to the table? No matter what, this looks to be a very momentous ocassion, and folks everywhere will be looking forward to this. I just hope the Gabbai knows enough to sit down at the shiur, and not make this into a spectacle by standing there next to him like some Royal bodyguard. Here we sit listening to guys like Schneur telling us how Chabad has it coming because it went from "Nevel and Minsk to Madison Avenue." They lost their way - they say - and we're just responding accordingly. Everything they do involves fund raising and collecting money - they say - they're terrible. In other words blame Lubavitch. They're terrible people who did not nothing to stop assimilation in the US despite 60+ years of outreach and education. OK. I hear what they're saying. Then I open the papers and read online how Aish's tactics are under attack, how they're PAYING people to go on Birthright trips with them, but I hear nothing from these same righteous sages. OK, there's nothing WRONG with paying people to go to Israel, maybe that's why they're silent. Why Aish gets a free pass with all their antics is very simple. You and me know it, and they know it. It's because they're the antidote to Lubavitch. It's so the Yeshivishe Velt can say "We do Kiruv too, and we do it the right way!" But that's the seder Ha'olam, and you get used to it after a while. You realize that you're in a minority and you make due with the situation. Then there are times that it just gets to you. You buy a Jewish newspaper because there's nothing else to read, and what else would you want your kids to see, and you're ready to puke. There they are, the Kiruv workers with their "Shelichim", collecting money already for the Jews of Tbilisi, since according to them they're the ones who are responsible for the Russian BT Movement, and they're the ones who are caring for all the Jews in the FSU now, especially Tbilisi. We KNOW that's the case because the Mashgiach HaDor goes there and hugs the little Russian/Georgian kids, so it MUST be so. So if you have a conscience give to the Vaad, they'll save them. איי they just had a huge dinner where all the fatcats came and felt good about themselves that they support Kiruv? that doesn't matter, I guess all that money already went to good use. There, I'm rattling again. Let them have their money and their spotlights, it's none of my business. It's G-d's world, and right now he seems to like them more. After seeing what a group can do when it has the press backing it and helping it spread the exaggeration what remains for the outsiders like Lubavitch? Here's a theory I have: One reason Chabad has to try so hard to get its message out is BECAUSE of the fact that they're shut out from the mainstream Jewish press! The Rebbe understood how the human mind works and that word needs to get out if Shluchim will ever make it in their towns. The fact that it's perfectly acceptable - in the eyes of the Charedi world - for a Kolel or Aish guy to move into an established community with a strong Chabad presence and ride the backs of these Shluchim, and take their people tells us how righteous these Kiruv professionals really are. Yet when a Shliach comes to a town where the old Rabbi there, someone who last did anything in 1966, has zero contact with those Jews who never step into his shul, and starts a kindergarten, or G-d forbid a minyan in his basement, the world comes to an end. The point here is that the perception that Lubavitchers are these terrorists who come and disrupt the pristine atmosphere that the Agudah/YTV/YU/TU set up all across America and the world is an image that you'll see only in the press. Kind of like Madison Avenue showing you that all housewives are perfectly groomed and manicured while baking cookies in a spotless kitchen. A reader commenting via e-mail on Circus Tent - It's Not Just Lubavitch. "You hit the nail on the head with your post on the kuntres. I think I can give you a mashal to understand why Litvaks hate davka Chabad but give other chasidim a pass. It's a well-known stereotype that secular Jews love Chinese food. There's even some kind of minhag of going out to Chinese Restaurants on Kratzmich. (I first heard of this from secular friends when I was 20; it was so obvious to them that this is what you do). Where does it come from, this love of Chinese food? The explanation is simple. When the second generation of American Jews dropped the basic standards of kashrus that their parents held -- kosher meat, not basar vechalav -- it wasn't so easy for them to eat treif meat, especially davar acher (pig, ham, bacon.). After all, chazer is chazer. So Chinese food was a way out. Since you couldn't recognize the food -- it didn't have all of the associations that treif American cuisine had. You couldn't see the pork. It was a way of easing the adjustment to non-kosher food. I think the reader hit this one on the head. Most Litvak hotheads have as much in common with real Machshovoh as a chipmunk does, but they have a knack of making mountains out of molehills. They can take a Posuk, ask a Kashe, and build Mt. Everest - all one one OysgeKrochene Boych S'voroh, but that'sa not Machshovoh. What that means is they don't understand what Chassidus is about, and have no real "taynes" against its teachings. We can also safely assume that the so-called Kano'us we see from them these last 30+ years is just not the real thing. Once we eliminate that we need to look elsewhere why they so dislike Lubavitch. The Chinese Food analogy is the closest thing to the truth we have now. I'm actually happy when I see books like these appearing on the scene. It tells all Chassidim to remember who their adversaries are and what they think of them. Oh, and if you think this is a fringe guy who speaks only for himself remember what you say when some fringe Lubavitcher prints his boych s'voros about the Rebbe etc. He's basing it on what he heard and was taught. So too here, there's no doubt in my mind that this dude took what he heard from his mashgichim and Roshei Yeshiva, and what he saw from his Chasidishe neighbors in Bnei Beraq, and expounded on it. The link has 16 pages that are controlled by the tab at the top of the first page. Kind of like a PDF, just different. It seems like somebody there finally realized that this isn't a small store in Boro Park anymore, and that you can't just ignore a mountain of bad news. They organized a mission to Postville and showed them first hand what happens there. I'm happy that there was a mutual understanding; that both the Rubashkins and the broad array of organizations saw the need to join together and get the message out. I'm publishing the Hamodia piece only because somebody was nice enough to send it to me. I understand that Pinchus Lipschutz of the Yated was there too and wrote a very lengthy and supportive report about his trip to the land of the Hawkeye. He's to be commended, as are all of those made the trip. I was recently made aware of the DaatTorah Blog. In a nutshell; the blog can be defined in one word: Hateful. In a scholarly, "We're concerned about the problematic teachings and sichos" kind of way. Which is kind of like the white supremacists pointing out the "problematic passages in the Talmud." If you have a problem with Jews then you'll believe anything. The same goes for Lubavitch, a microcosm of the entire Klal Yisroel. What DaatTorah is, is basically rehashed Areivim posts and thoughts by some of the shining stars who post there, Mr. Eidensohn included. One thing did surprise me, the fact that he put his name and picture up for all to see. His name is on all his comments on Areivim, but the picture adds a nice touch to it. Makes it a very open exchange of ideas and of opinions, and shows that he truly believes in what he opines, and is willing to put his face behind every comment. Why does that surprise me? After all, it's only the ones who show the hypocrisies of the mainstream that need to worry about their safety and the education and marriage prospects of their children. They're the ones who are terrified of people finding out who they are and phone calls made to their childrens' chadorim and schools that the ____________ kids are not be allowed there anymore. Not that I think I need to worry about THAT aspect of it, or at least that's I'm told, but I do need to worry in general, you never do know which zealot can decide that I offended his something or other and deserve to be hurt or my property damaged. So we live in anonymity, and the Eidensohns of the world are out there for all to know, maybe even thinking of themselves as respectable gentlemen doing what's right ------ fighting the evil empire, Chabad. If you're wondering what happened to the previous pictures, and why I suddenly deleted them, chalk it up to me being too much of a nice guy. I worry too much about people's feelings, and they know it, they take advantage of it and me. So I removed them. At least for now. Something about 50 year old pictures "belonging" to somebody. Nonsense, really. I don't know why I allow myself to be railroaded like that. But since פטור בלא כלום אי אפשר, we do have somewhat of a consolation prize, possibly a never-before-seen picture. 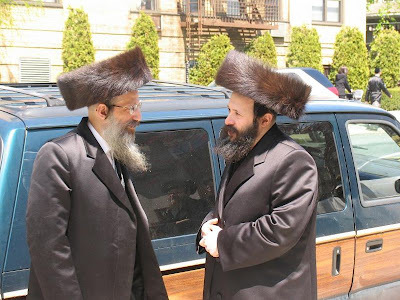 The current Chernobler Rebbes in New York and Bnei Brak are the sons of Reb Meshulem Zusia Twersky, zt"l, of Bnei Brak. Reb Chaim Yitzchok was the son-in-law of Reb Shayele Halberstam of Tshechoyv, known as Reb Shayele Tshechoyver, hy"D, the youngest son of the Divrei Chaim of Sanz. Reb Meshulem Zusia was also a mechutan of the current Bnei Braker Vizhnitzer Rebbe, tzu lange yohren, his son Reb Srool'che is married to RMZ's daughter. A Viznitzer Chosid once told me when he went to a tish of RMZ he was surprised to hear him sing the Sanzer Shalom Aleichem niggun Friday night with a Russian/Litvishe Havoroh. 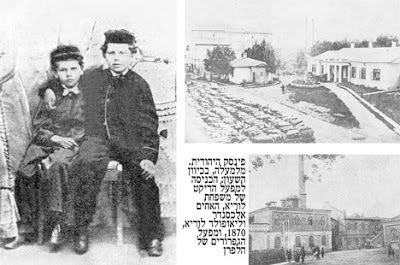 RMZ was a Talmid of the Chabad underground Yeshivos, and later escaped to Poland to his zeide, Reb Shayele, hy"D.
Today's Chernoblers are the grandsons of Reb Chaim Yitzchok. Judging from the pictures here they seem to have reinvented themselves to a degree, at least as far as the external trappings are concerned. 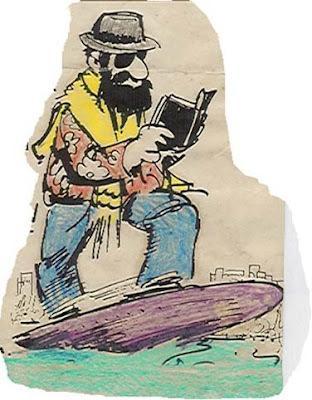 They look almost like a typical Galicianer Rebbe; maybe that's the Sanzer influence. Reb Chaim Yitzchok was arrested in Kiev and first sent to Siberia and then tried again and sent to Kazakhstan, where he passed away. The picture here is from his KGB file from Kazakhstan. The file states that he was online for something and someone overheard him say something against the government so we was sent to Kazakhstan for 10 years. Only one photo existed of him till 2 months ago. The new photo is shortly before his death.